Many, many mothers are told that night nursing is the same as bottle propping, that night nursing can lead to tooth decay or cavities. The evidence shows otherwise. This large study based on over 1500 children in New York state showed that while breastfeeding correlated with a 40% reduced risk for early cavities, other factors like poverty, maternal age at birth, and maternal smoking put children at increased risk for cavities and that seemed to cancel out the positive effects of breastfeeding. Poverty leads to a combination of lack of health knowledge, limited access to healthcare, poor diet, potentially poor prenatal care, and inadequate self-care, and those things lead to increased cavities in children. Kellymom analyzed another study where researchers studied skulls of humans from 500-1000 years ago and found that tooth decay in babies was rare. Of course, these ancient babies were breastfed (because bottles had not yet been invented)–and most likely they weren’t sneaking their big brother’s Lucky Charms. The Kellymom article talks about a lot of different studies about the cause of cavities and components of breastmilk. It’s worth a read! But you might be wondering why night time breastfeeding is so different from bottle propping. Because nursing is different from bottle feeding. Breastmilk doesn’t pool in a baby’s mouth–milk does not flow from the breast unless baby is actively sucking. A nursing baby draws milk into the mouth behind the teeth: a proper latch means milk is coming in waaayyy in the back of the palate, and if baby is actively sucking, baby is actively swallowing. In the end, your child is at much greater risk of cavities from eating a lollipop than from nighttime nursies. Don’t let fear of cavities push you into nightweaning if you are not ready to do that. 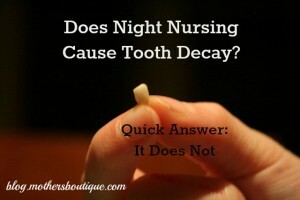 1 comment to Does Night Nursing Cause Tooth Decay? Fascinating! I suppose this study goes to show that correlation does not always equal causation. This will ease a lot of nursing mother’s minds that they aren’t actively damaging their baby’s teeth. Thanks for sharing!